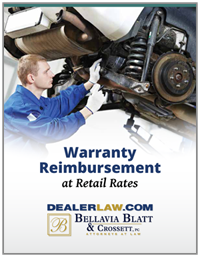 MINEOLA, NY, September 17, 2014-In an amended complaint filed this week, 20 additional terminated Chrysler dealers have joined Bellavia Blatt’s lawsuit against the U.S. Government, raising the total number of plaintiffs to 168. In 2009, the President’s Automotive Task Force ordered Chrysler to close 789 of its 3,200 franchises as a condition of a government bailout, as it believed Chrysler dealers were an expense to the company, which was later determined to be mistaken. In response, Bellavia Blatt filed a lawsuit stating the termination of the dealerships was a “taking” — a violation of constitutional law, which says the federal government cannot take property without paying “just compensation.” The lawsuit seeks compensation for the terminated dealers for the value of the dealerships. The U.S. Court of Appeals recently ruled against the U.S. Treasury’s motion to dismiss and allowed Bellavia Blatt the opportunity to amend the complaint, including adding 20 dealer plaintiffs. “The recent Court of Appeals ruling validates the legitimacy of our lawsuit against the government and gets us one step closer to justice in receiving compensation for these terminated Chrysler dealers,” said Bellavia Blatt Senior Partner Leonard A. Bellavia. Please visit www.DealerLaw.com for more information regarding this lawsuit.